Rich, indulgent foods adorn many winter dessert tables. Sweets of the season tend to be rich in flavor but also calories and fat. Still, you don’t have to deny your sweet cravings. It is possible to create satisfying treats that are healthier than traditional fare. With these quick nutrition-savvy tips, decadent desserts has never tasted so good. Try fresh variations to old classics to give your homemade desserts a gourmet twist. Add a dash of vitamin A-rich chili powder for a bold take on dark chocolate brownies or tarts. Experiment with exciting combinations like lavender and lemon for a bright, unique flavor and a healthy dose of iron, plus vitamin C. Mix antioxidant-rich basil and cinnamon to produce a powerful taste sensation with added health benefits. When deciding on a recipe for your next gathering, take a look at its nutritional value, as not all desserts are created equal. To create reduced-guilt baked goods use alternative ingredients, such as egg whites instead of whole eggs or whole wheat flour instead of white flour. Apple sauce is also a clever way to introduce moisture into cakes rather than using oil. A reduced-fat pumpkin pie – which can be made by blending pumpkin with healthier ingredients, like egg substitute and non-fat milk, in a Vitamix Professional Series 200 – may be significantly lower in calories and fat than pies made with full-fat ingredients. As an added bonus, the leftover pumpkin pie ingredients, plus a few extra items likely on hand in your kitchen, can easily yield a low-calorie, frosty Fall Freeze. This smooth, frozen treat is the perfect way to enjoy the fruits of your labor while baking for company. Don’t discount chocolate. In addition to being delicious, dark chocolate with at least 70 percent cacao contains heart-friendly antioxidants. Make a festive fondue platter with warm dark chocolate and sliced fruits like bananas, pineapple and strawberries. Similar to a traditional fondue table, by creating a variety of dips and glazes, you and your guests can indulge in a sinfully good concoction that is still light on calories. For dips, opt for a Greek yogurt base that is high in protein and sweeten with natural ingredients, such as agave nectar and honey. A cinnamon glaze made with soy milk and tofu will please your palate – even if you follow a vegan diet. Anyone with a sweet tooth can attest to the desire to eat with abandon during the last course. However, controlling portion sizes – whether cutting thinner slices of cake or splitting a piece with a friend – is an important part of smarter indulgence. Better yet, stick to smaller servings by getting creative with the end product. 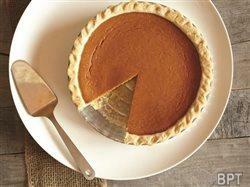 When baking a pie, lose the top crust. Or, instead of a pie, try a bite-size tartlet. Encourage sampling by making mini-muffins and cupcakes rather than their oversized counterparts. Making a few small changes to your ingredients and your intake will lower calories, provide some unexpected nutritional benefits and keep you satisfied all season long. Here’s a great recipe for a perfect guilt-free dessert. Select Variable 1 on the Vitamix.